How switched on are you? Internet connected devices are taking over our homes. There are now 8.3 million smart devices in use and, with new technology constantly being developed, this number is ever-growing. I recently got an Amazon Echo Spot for my birthday and enjoy the features, modern look and how easy it is to use. However, when I was setting it up, one of the first things I did was turn the camera option off. These connected devices are a good way to keep up to date in the modern world, but are they listening in, or even watching? Whether or not you’re already familiar with internet connected devices, or even own one, Never Alone is an excellent introduction to the topic. An example of the increasingly ubiquitous Amazon Echo is on show: this is a slim smart speaker containing Alexa, Amazon’s virtual assistant, who can answer questions, find music for you to listen to, and keep track of your shopping list. You can also learn about Amazon Dash Buttons, small devices designed to make shopping easier. Press the branded button and the item will be automatically reordered for you. You can get a button for any item you buy regularly, from your favourite coffee brand to cleaning products and toiletries. The devices are small and bright—perfectly designed to be placed around the home. When we think of online shopping, we usually imagine accessing a website via a computer or phone and filling out an address and payment details before we can make our order. With these buttons, however, the act of buying a product is reduced to a simple touch. Similarly, with the Echo, you can use your voice to shop by asking Alexa to order a product. The more you look around the exhibition, the more you realise how connected we are to the internet. 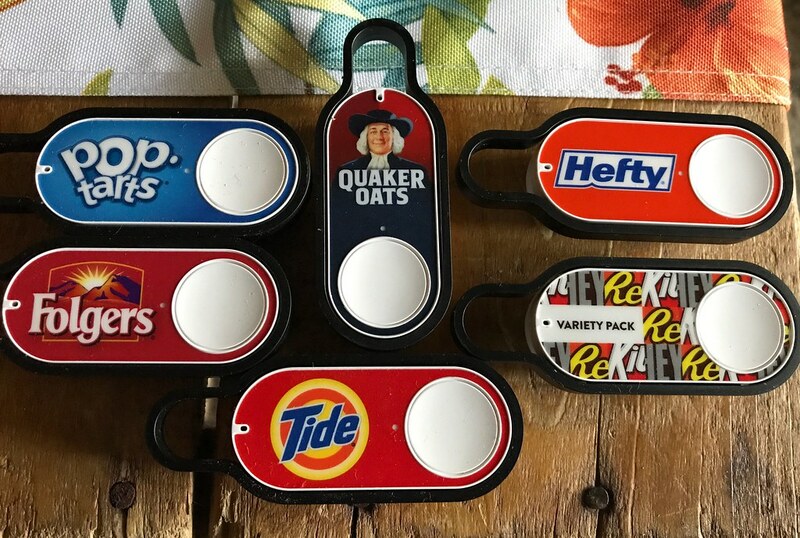 Almost anything in the home can be done at the touch of a button—either on our smartphones or, as in the case of Amazon Dash Buttons, literally. Internet connected devices make everyday tasks achievable in seconds, helping to maximise our free time. Want the latest headlines? No need for a newspaper: ask Alexa and she’ll brief you. Want to check on your pet? Use the Alexa app on your phone to check the camera on your Amazon Echo Spot at home. Want the kettle boiling before you get downstairs? Use a smart plug. These can be used on almost any household appliance; the plug connects to your Wi-Fi and lets you turn the power on via your phone. Like any new technological development, the rise of such devices has sparked concerns. Are the details of our consumer habits are being sold? Are we being listened into in our own homes? Ultimately, however, we live in the digital age, and I think these devices are helping to embrace that, giving us more opportunities to use the internet to our advantage. It’s interesting to imagine the homes of the future, which may come with internet connected devices already built in. Our homes might be so switched on and connected that we won’t even have to go into the office to work—everything will be easily accessible from home. Organisations like BT are already offering advice on how to make your home smarter. I watch a lot of YouTube and often see people doing a ‘digital detox’ to break away from the ingrained influence of the internet. Perhaps, then, it’s not a good idea to have internet connected devices in every room—sometimes it can be nice to switch off altogether. This is a topic that’s sure to inspire strong views. Whatever your opinion, Never Alone is a great overview of internet connected devices and how they can impact our lives. The exhibition also looks at how devices have developed, going back to the 1800s and the first camera so you can really see how far technology has come. Just be careful, because you may come away with a rather long wishlist! Never Alone is open at the National Science and Media Museum until 10 February 2019. Laura is a volunteer at the National Science and Media Museum. There are 135 posts by guest authors.